After we’re done with my current 4-session dose of Ars Magica, my Monday evening group is going to be doing some Feng Shui, so to get ready I acquired and had a read of the core rulebook. This is the 1st edition book, since it’s the version we’ll be playing, but apparently the new 2nd edition is very similar with a few points of distinction. Feng Shui bills itself as being the Hong Kong action movie RPG, and on that front it knocks things out of the park – indeed, it’d be pretty decent for most other action movie genres at that. There is a default setting in which feng shui sites all over the world are the key to a Big Trouble In Little China-esque battle for occult supremacy that takes place over a swathe of time periods, ranging from ancient history to a cyberpunk future, but it’s completely viable to ignore this if you want to. The best thing about the default setting is that Robin Laws packs into the core book all the stuff you need to support play in any of the time settings presented, which cover more or less all the potential settings you might want to run an action movie RPG in. Running Feng Shui in a homebrewed setting or a specific movie’s world will in many cases be as simple as deciding what bits of the book you want to leave off the table, rather than having to cook up a bunch of new stuff. 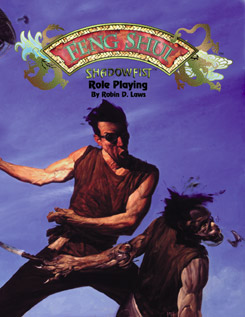 Feng Shui came out in 1996, the same year as Deadlands, and there’s a very similar design approach there – you have a comparatively simple and easy to grasp core system that nicely encapsulates the style of the genre it’s going for, and then all of the different weird little bits that can get tacked onto that are partitioned off into their own chapters and if you are not playing a character type that interacts with that, you never have to bother with that information. This is great from a player’s point of view, but does means that there’s lots of different systems for exceptional weird stuff that the referee has to keep track of, especially if you have a broad variety of very different characters. Even then, the majority of subsystems are reasonably simple (as you might expect, the whole martial arts styles thing is probably the most complex one), and it will be a rare game where all of them are being used a lot of the time. And, of course, if you decide to not use the time war and go for a more specific genre, then the game actually gets simpler because you’re probably going to be setting aside a lot of optional systems that don’t apply to what you’re doing. Robin Laws gets a lot of credit as a system designer, but the system here is actually based on that from Nexus: The Infinite City, Daedalus Entertainment’s previous RPG, which was primarily credited to Jose Garcia and had Laws down as a contributor, and the intertwined development history of these two games is interesting and worth unpicking. Laws, having helped John Tweet write Over the Edge, had come up when the general idea of a Hong Kong action movie RPG (which of course became Feng Shui) in 1993 and had approached Garcia with it; Garcia liked the idea, but wanted to get Nexus out first, which Garcia’s new publishing company Daedalus did in 1994, and then Feng Shui was delayed further when in 1995 Daedalus decided to prioritise hopping on the collectable card game bandwagon and produced Shadowfist, set in the Feng Shui setting. What’s interesting about this is how Feng Shui went for offering just such a setting-hopping approach, but with Laws’ understanding of how system affects tone and atmosphere keeping things within the action movie genre, rather than trying to encompass every genre imaginable like Nexus did. Feng Shui may be flexible in terms of setting but it doesn’t try to be a generic RPG to the extent that Nexus does. You can see this in how Nexus doesn’t provide character templates like Feng Shui did but instead invites you to build your character concept from scratch with building points, much like GURPS. Templates don’t work for generic RPGs because archetypes appropriate in one genre are incongruous in another, but they work great for Feng Shui. Feng Shui is a great example of how Laws bucked the trend of 1990s designers to assume that system didn’t matter – that it was a necessary evil and you had to just throw it out there and get it out of the way quick. It’s also a great example of how setting and system can support each other – the mere presence of the Transformed Animals chapter tells you something about the setting that is distinctive and interesting. I, for one, am looking forward to this campaign.